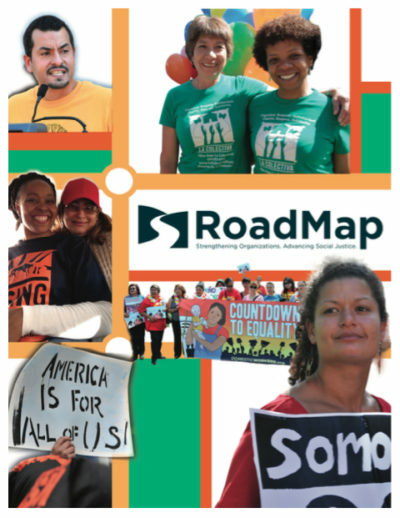 RoadMap offers packages of webinars and follow-up, on-site training to support organizations in targeted areas of work. These packages can be purchased by funders, alliances and individual organizations. Currently, we are offering two “webinar plus” programs on financial management and fundraising. Our “Strengthening Your Organization’s Financial Health” webinar series is led by Carol Cantwell, RoadMap consultant and the principal of Fun with Financials, along with two other RoadMap consultants, Alfreda Barringer and Margi Clarke. The webinar series begins with a review of key financial concepts such as Temporarily Restricted Net Assets and Unrestricted Net Assets and the importance of utilizing unrestricted assets to build up a reserve fund and manage budget deficits. The series continues with a review of the processes for grant tracking by grant time periods, how to read an Audit or 990 and the Statement of Financial Position, among other key financial management tools. Specific guidelines are offered (accompanied by written materials and worksheets) for establishing a healthy reserve fund, monitoring the organizational budget, forecasting cash flow, creating a culture of financial transparency, and asking strategic questions to guide financial decision-making. One of the core features of the webinar series is the specific guidance provided for managing during financially challenging times, including scenario planning to address financial uncertainty/instability, techniques for communicating and engaging the Board in financial management decisions, processes for figuring out cost-cutting measures and managing budget cuts, cost-sharing for back office operations and more. The webinar series concludes with specific recommendations for stepping up fundraising strategies to build financially healthy organizations. This webinar series begins with an overview on the importance of building a fundraising culture within organizations and the multiple reasons groups should include grassroots fundraising as part of their fundraising plan. This webinar series is led by Kim Gilliam and Rebecca Johnson, and it helps participants explore how the organization can identify various levels of constituents or constituent circles and how to turn constituents into donors through sustainer programs and other strategies. Participants are introduced to the concept of the fundraising planning cycle and are provided with tools and case studies on how to develop a diversified fundraising plan with clear fundraising objectives, financial targets and accurate staff time allocation processes. Additionally, the webinar series examines the critical function of the fundraising database, exploring the advantages and disadvantages of various fundraising software programs. In the second and third part of this webinar series, we pay attention to the subject of major donor development. This section of the webinar series begins with a powerful case study featuring the highly successful fundraising program at Kentuckians for the Commonwealth. Participants are then introduced to the key steps for developing a Major Donor Campaign, including strategies and resources for identifying potential major donors, preparing the case for donor support, the step-by-step process of initiating the major donor campaign, stepping-up donors and tips for donor relationship management. Special project assisting groups to prepare and protect themselves by Getting their House In Order and creating Crisis Communications response plans. Upon completion of either of the two webinar series, each organization will also be matched with a RoadMap consultant. Together, they will develop specific goals and outcomes for the consultation engagement, and 5-10 hours of individualized consultation will be delivered in the selected content area. Maximizing social media for fundraising purpose. Click here to request services, or join our mailing list to receive more information.